What is bee or wasp sting allergy? Allergic reactions after bee and wasp stings are uncommon. It is normal to have some pain, redness and swelling where you have been stung. Some people consistently have large painful swelling around the sting. This is not an allergy, but a reaction to the chemicals in the sting. If very sore and swollen it may need medical attention. A few people develop hives, breathing problems or faintness after bee and wasp stings. These are symptoms of allergy and you should seek immediate medical attention. The risk of an allergic reaction is greatest if a second sting occurs 2-8 weeks after the first. People allergic to wasps may not be allergic to bee stings and vice versa. If you travel abroad, other insects such as fire ants (USA) and hornets (Europe, Asia, US) can cause allergic reactions, but this is not a problem in the UK. All patients suffering from allergic reactions to bees and wasps should be referred to an allergy doctor. Bees and wasps are most likely to be sting in summer and early autumn. Wasps build nests in sheltered areas including trees and roof spaces. They are attracted to sweetened and flavoured drinks, fallen ripe fruit, and dust bins. Bright colours and fragrances can also attract them. Careful handling of ripe fruit, well-fitting lids on bins, not leaving opened drinks, avoiding drinking out of cans can reduce chances of being stung. Local councils can help to remove nests from homes and gardens. What should I do if my child is stung? 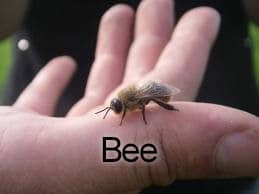 Bees leave the stinger in the skin and die soon after stinging. 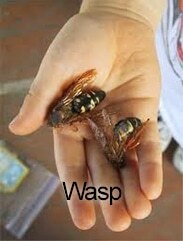 Wasps do not leave their sting or die after stinging. They can sting again. Walk away calmly to prevent being stung repeatedly. Removing the sting– Remove the sting and venom sac by scraping it out, either with a fingernail, or something with a hard edge such as a credit card, as shown in the picture. Be careful not to pinch or squeeze the venom sac (e.g. with tweezers) as this might spread the venom further under the skin. hives and swelling can be treated with antihistamines. more severe reactions need urgent medical attention. These include: difficulty breathing, wheeze, tightness in the throat, faintness or collapse (anaphylaxis). They can occur with or without hives or generalised swelling. Which patients should be referred to an allergist? Patients with local reactions, even if they are large, do not need to see an allergist. Patients who have an allergic reaction after a bee or wasp sting, including those with only a skin rash (hives) should be shouldbe prescribed and shown how to use an adrenaline pen (auto-injector) by their GP and referred to an allergy doctor for further tests and treatment. Adults are sometimes given injections (immunotherapy), but these are rarely required in children. Is insect venom allergy life-long? Only 10% of mild allergic reactions will recur after repeat stings.